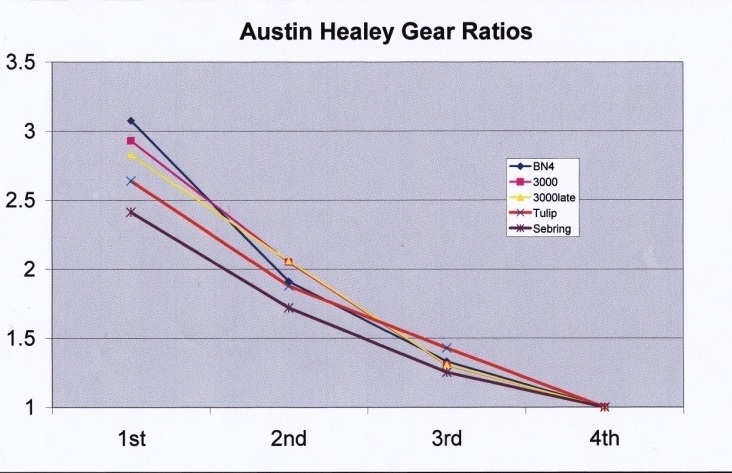 The above graph depicts the gear ratios for the BN4, 3000 and later 3000s and compares them to the Tulip and Sebring ratios used by the DHMC and BMC in racing and rallying. - the very low 1st gear of the 100-Sixes and the big gap to their second gear. - The Tulip gear set has a relatively low third gear which effectively results in a real 6 speed gearbox as overdrive third is not the same as forth.